Events happening as far the Arctic can have a profound effect on places far from it. Going back to the example of the farmer in Kansas, he right now along with much of North America is suffering from the effects of a severe drought which is theorized by scientists as being prolonged by the melting of the arctic ice caps. As snow coverage in the Arctic diminishes especially in the summer months this apparently has detrimental effects to climate south of it. 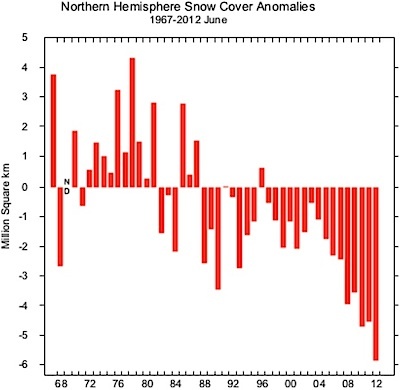 The scientists theorizes that as a result of fewer and fewer snow cover in the arctic during the summer months results in more heat being retained, which in turn results in a dramatically altered jet stream which leads to midsummer weather patterns in the middle latitudes to continue longer than expected. As a result weather in the fall is much warmer and drier than usual.The hypothesis is still to be fully proven by scientists for they they are still debating whether the warming in the arctic is caused by humans or is natural, but based on the evidence so far both the drought and the warming of the arctic have shown some link between each other. Besides affecting North American climate, the melting of the Arctic ice has also been theorized to have extreme consequences in Europe. As a result of the melting ice, the jet stream is slowed and as a result weather conditions tend to linger, leading to far more extreme ranges of temperature, which in Europe’s case is longer more colder winters. Whenever Arctic sea ice levels are low, Northern Europe in particular suffers from severe winters like in 2007 and 2011. In the age of globalization, one must learn about what is happening beyond his/her local domain. This can be done by reading/watching/listening to more international news, while at the same time the media should give more coverage . The apathy for non-local(national) environmental problems is something that should be eliminated, for long distance problems have a way of finding a way to affect those far from it. Into the 21st century, a new problem is recognized as a threat to the international fishing industry: climate change. There are many known impacts on fisheries and aquaculture as a result of climate change and many known solutions to keep them at bay, but these issues need to be taken more seriously by fishing industries. The broad affect of climate change on the fisheries is the warming of the oceans; this in turn ruins the natural habitats of fish. One issue from this broader issue that has recently received fair treatment in the Canadian media is the study of decreasing fish size as a result of climate change. An assistant professor at the University of British Columbia, William Cheung stated, “Our study shows a substantial reduction in the maximum body size of fish”. Cheung claims that the heating of the ocean waters causes the body temperature of the fish to heat up which in turn gives the fish a higher metabolism. With a higher metabolism the fish require more oxygen, but with climate change, there is less oxygen in the oceans. “Without the oxygen, fish don’t grow.”, Cheung put it in simple context. The lack of fish size presents an issue for the fishing industry because a dangerous easy path is to over-fish and this overfishing could possibly lead to conflict because it will cause countries to clash. I’m not trying to be pessimistic, but history does repeat itself. A good example of fishing conflict in the past, though a non-climate change related issue, was the Turbot War where Spain was overfishing just outside of Canadian waters on the east coast, which affected the Canadian fishing industry in Newfoundland. This in turn led to a conflict; thank goodness not an actual armed conflict, but a diplomatic mess all the same. Even though I want to have hope, it’s hard for me to believe internationally that world fisheries will face the problem of climate change in a reasonable manner, but for what’s at stake we need to. Like most industries and government facing climate change, there needs to be much more commitment and mental change to keep the issue at the forefront of decisions. This is the exact conclusion other researchers came to in another article on climate change, “Government and industry need to anticipate changes, not simply react to them.” It’s simply not acceptable in this day and age with climate change to merely make small-term reactions to these problems, we need to innovate our current standards to effectively prepare for these problems. Practically, we need solutions in advance. Solutions aren’t easy to come by if people on the front line aren’t thoroughly educated on climate change. Education is the first step to solving any problem, how do you go about making a solution, if you don’t understand the issue? This doesn’t mean merely teaching a couple “high office” people about climate change in hopes they will spread the word. This means teaching everybody at every level of the fishing industry. Once a thorough education is established, then there is a starting point to create a solution. There are many solutions that have been developed, but I believe the key variable in any solution towards climate change is a technological change. I’m not an expert on mechanics, but a technology I can think of off the top of my head is an alternative energy source like solar power. Solar power can be used to power the fishing vessels which go out to sea, and this would help cut down fuel emissions. 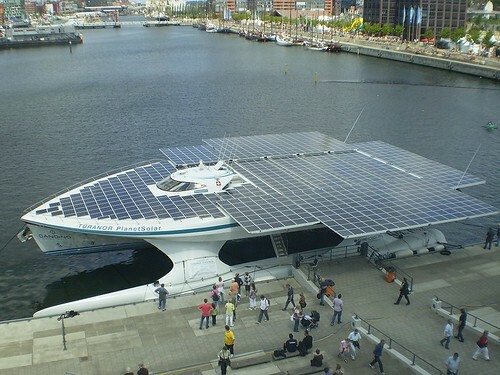 Do you think a solar powered such as this could be converted to a fishing vessel? But that’s just a very basic solution I thought of in less than two seconds, imagine what groups of people could devise if they were well educated on the topic. Overall, the international fishing industry will be and is already being challenged by climate change, but there needs to be rational long-term solutions; without it, there’s s strong inevitability of conflicts to come.